For a variety of sectors flat roofing is a great choice for a budget-friendly solution, however, despite their many positives the need may arise where your flat roof would benefit from being converted to a pitched roof. Whether it be for aesthetical reasons or due to water damage or deterioration of the current structure, a flat to pitch conversion is an excellent, relatively cost effective, time-friendly and unobtrusive alternative to a full roof replacement. If the flat roof of your industrial, commercial, housing or educational buildings are showing signs of becoming less efficient and more problematic then our team can recommend and design a bespoke pitched roof solution using lightweight steel structures and a variety of finishes to suit your budget. Our extensive experience in flat to pitch roof conversions plus our solid partnerships with key manufacturers leaves us perfectly placed to supply you with a solution which matches your individual requirements exactly. The first step to any roof conversion is ensuring that an intricate assessment and design stage has been carried out thoroughly. Our experienced roofing technicians will visit your site and provide impartial advice and solutions that will meet your long-term needs. You will be provided with clear and precise specifications and costs before any work is commenced. Once a design has been agreed on our qualified and skilled roofing experts will work in compliance with all health & safety and building regulations to provide you with a hassle-free roof conversion that is guaranteed to increase the longevity of your building. Using the highest quality materials available, lightweight modular structures will be built on to your existing roof meaning there will only be a limited increase to the weight that your building will be bearing. Despite being lightweight, the steel structures that we use are exceptionally robust and provide a multitude of benefits. 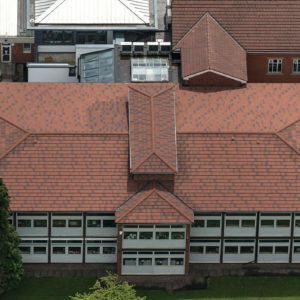 As part of our services you are also free to choose from a variety of roof finishes including strip tiles, standing seam, composite panels, traditional tiles and felt. The end result is a totally transformed building which has achieved increased efficiency, improved thermal performance, an extended lifecycle and an increase in property value. Using lightweight steel structures and a variety of finishes we can increase the longevity of your building, completely transform the aesthetics of any structure, and improve the efficiency of your roof by converting it from flat to pitched.